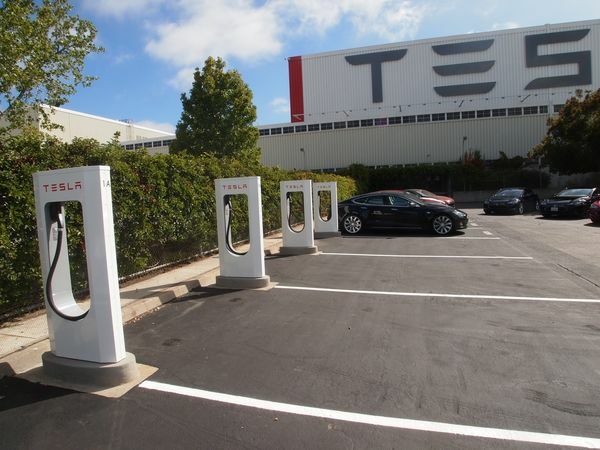 The Tesla Supercharger network keeps expanding, with the latest being what was perhaps the most obvious, at the Tesla Factory in Fremont. On Friday the company opened four Supercharger stations located on the Factory grounds, next to the center where customers pick up their cars. This puts a Supercharger location in the East Bay and also gives those picking up their car at the factory a chance to use the Supercharger right away. This makes the 17th Supercharger station Tesla has installed to date across the U.S. Nine are scattered across California, two in Washington State, one in Central Illinois, two between Washington DC and Boston, and two in central Florida. Speaking at the ceremony, Tesla CTO JB Straubel said the company was going to start a phase of rapid Supercharger installs, or about 2-3 per week for the foreseeable future. The goal remains to build a cross-country network by the end of the year, and the company is falling behind on the announced goal. According to the Supercharger website - by the end of Summer 2013, there should be a couple Superchargers in Texas, one in Denver, more in Florida, more in California, one near Chicago, and more along the Northeast corridor including one located south of Washington DC. By the end of the Fall 2013 there should be plenty more, including a full string along the West Coast and the East Coast. Then during the Winter of 2013, a corridor is expected to be open which goes from Los Angeles, to Las Vegas, to Salt Lake City, then through South Dakota to Minneapolis, to Chicago, to Detroit, and thence to New York City. During 2014 other areas will get Supercharger presence, and multiple cross-country routes will exist. As for the station in Fremont, it is behind an guarded gate on Tesla's factory property accessed via private roads on the site. Even though the location on the factory grounds is semi-public, it's likely the Supercharger will not be open at night. This location doesn't fit the model of using public locations with other amenities such as restaurants or coffee shops. For example a short distance away there's a Target store with almost a dozen ChargePoint stations out front. That Target store is in a shopping area that also includes restaurants. This is the exact sort of setting that Tesla says they prefer for Supercharger locations, because it will be a convenient location for Model S owners to hang out for an hour while the car charges. Over at the Tesla factory there is no such facilities, just a Tesla Store and the special aura that comes from hanging out on the Tesla factory property. The location on their factory grounds however was easy for Tesla to do, and perhaps serves other purposes for the company. Not only would it be convenient for customers who are picking up their cars, but any tour of the factory it can now include a Supercharger demonstration.